In the last decade, the paradigm of smart growth has prompted many communities to improve the physical design of downtowns and neighborhoods. The precepts of smart growth include building more compact, walkable communities; allowing more mixing of land uses; providing transportation options other than automobiles, including public transit, and bicycle, and pedestrian facilities; and balancing jobs and housing to reduce commute times, improve air quality, and reduce reliance on cars. When communities make and implement plans to grow smarter, the result can be the creation of places that allow for more walking and physical activity than is typical in many post-war suburban and urban environments. That said, while there been more opportunities for physical activity created as a byproduct of smart growth principles, communities have not developed any systematic way to incorporate those opportunities in the normal course of planning. Many communities have yet to take steps to improve their physical design in any context, much less one that addresses physical activity. This report looks at how planning processes, development regulations, and community participation can be used to ensure that development patterns facilitate everyday physical activity. Includes information about safe routes to school programs and accessible schools, along with case studies. APA and its members are uniquely situated at the center of the diverse array of interests that must be brought together to address the issue effectively. These interests include smart growth generally, and specifically urban design, neighborhood planning, housing, safe and efficient transportation, parks and conservation, economic development, town center development and revitalization, and environmental protection. Further, in the last several decades, many states, including New Jersey, Maryland, and Oregon, have taken an active role in promoting smart growth in communities and neighborhoods. The approach APA will bring to these program activities will be to identify and focus on the strategic points of intervention — where the most critical community planning decisions are being made that affect future physical activity. 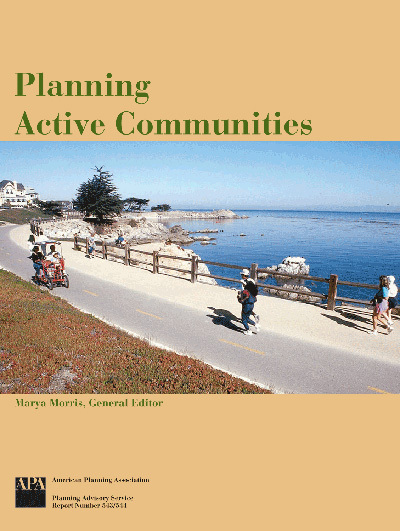 In spring 2003, with the assistance of Readex Research, Inc., in Stillwater, Minnesota, APA conducted a random survey of 10,000 public agency APA planners about how planning can create opportunities for citizens in their jurisdictions to become more physically active. Surveys were sent via an email message, which contained a link to a survey hosted by Readex Research, Inc. Responses were tabulated until there were 1,000 usable responses. Survey results point to growing recognition among elected and appointed officials about using policy to increase opportunities for physical activity for residents. Further, many officials recognize that community planning and design have a role in creating these opportunities. We also asked respondents what actions their jurisdictions had taken to implement smart growth objectives, such as increasing development densities, expanding transportation choices, and promoting mixed use. Many respondents indicated that multiple actions were being taken to support smart growth. Many of these actions are wholly supportive of the objective of creating communities where citizens can be more physically active. Despite that support, the survey revealed numerous barriers that must be cleared before "physical activity" is a regular element in plans and planning processes. Sixty-four percent of the respondents indicated the physical activity of residents is either an emerging or important issue for elected and appointed officials in their jurisdiction. Sixty-four percent indicated the relationship of community planning and design to physical activity is an important issue for elected and appointed officials. Forty percent said physical activity "is not considered a planning issue," and that fact was the primary barrier to giving greater consideration to the effect on opportunities for physical activity in projects and plans. Sixty-five percent of the respondents indicated their agency has collaborated with the parks and recreation department on physical activity issues; only 4 percent indicated they had collaborated with the public health department. Local governments have been very active in implementing smart growth code reforms supporting walkability and active communities. Since 1993, 81 percent have enacted a mixed-use ordinance, 72 percent require or recommend that bicycle and pedestrian trials be incorporated into new developments, 68 percent require open space to be preserved in new developments, and 62 percent have revised ordinances or plans to increase development densities to support public transit. Regarding specific facilities jurisdictions may have installed to support bicycling and walking, 33 percent indicated they require sidewalks in new developments, and 53 percent reported that sidewalks are required in some new developments. Also scoring high was a requirement for five-foot-wide sidewalks, which planners generally regard as the minimum width to allow two people to walk abreast comfortably. Thirty-four percent of survey respondent jurisdictions require such sidewalks, and an additional 41 percent require them in some but not all areas. Seventy-three percent had inventoried recreational facilities. Sixty-two percent had increased spending on bicycle and pedestrian facilities. Sixty percent have conducted visioning processes that addressed, at least to some extent, the attitudes of residents about bicycling and walking. A full commitment to planning and designing a physically active community calls for inclusion of health and activity policies, goals, and objectives in the local comprehensive plan and other functional plans. Sixty-four percent of respondents said the jurisdiction's parks and recreation plan addressed physical activity, as did 61 percent of the comprehensive plans, 47 percent of bicycle and pedestrian plans, and 35 percent of transportation plans. Further analysis will be necessary to determine whether these plans actually contain policies specifically encouraging physical activity as opposed to an inference by survey respondents that the inclusion of bicycle and pedestrian elements and quality-of-life goals in plans are the equivalent of specific policies. Figure 1 Inasmuch as new public policy at the local level derives from how the mayor, the city council, or other officials react to specific events, trends, or new information, it is clear local officials have taken notice of the physical activity issue. Twenty-eight percent of respondents indicated that local appointed and elected leaders in their jurisdiction regard the physical activity of residents as an important public policy issue; another 36 percent said officials regard it as an emerging issue (Figure 1). A majority of planners reported that local officials in their jurisdiction recognize a role for them in helping residents increase their level of activity, improve their health, and reduce the rates of overweight and obesity among residents. Figure 2 Numerous factors have contributed in varying degrees to the increase in the rate of obesity and overweight in the U.S., including changes in diet, reliance on fast-food, and a sedentary lifestyle. Community planning and design can also add significantly to the problem (e.g., the design and location of neighborhoods that preclude walking, bicycling, or any mode of transportation other than the automobile). To improve the built environment to encourage physical activity, local officials have to recognize that community planning and design — including land use, development patterns, transportation choice, and neighborhood design — are all part of the solution. According to the survey (Figure 2), 25 percent of respondents said local officials in their jurisdiction recognized the relationship and another 39 percent said local officials' awareness of the relationship was emerging. These results are in line with the results shown in Figure 1, wherein more respondents (28 percent) said that physical activity is an important overall public policy issue for local officials, and slightly fewer (36 percent) said it was an emerging issue. Figure 3 By their nature, comprehensive plans and land development regulations address a broad scope of community issues, including land use, housing, transportation, the environment, urban design, and economic development, among other elements. Of the responses charted in Figure 2, approximately two-thirds (64 percent) of respondents said local officials recognize the relationship between improved community planning and design and physical activity as an important or emerging issue. Despite that, barriers remain to full incorporation of the issue in the explicit goals and objectives of plans, projects, and regulations (Figure 3). The largest barrier, according to 40 percent of the respondents, is that physical activity is not regarded as a planning issue. Presumably that segment of respondents is comprised of both those who indicated physical activity is not currently under discussion in their jurisdiction, as well as those respondents from jurisdictions where it is, but not to the point where plans, projects, and regulations are being modified to support it as a goal. The second greatest barrier (reported by 28 percent of respondents) was that physical activity is an assumed, not a stated, goal. This is confirmed in later survey questions where we asked respondents to indicate which of their jurisdiction's plans contain a goal or objective to promote and encourage physical activity. Like most local government agencies, planning departments are perpetually faced with limited resources to tackle complex work programs and responsibilities. In that vein, 13 percent of respondents said the barrier to incorporating physical activity was that it would detract from other departmental priorities. Figure 4 For a community to succeed in increasing opportunities for physical activity for residents, planners will need to form new partnerships with other agencies and nongovernmental organizations. Planning departments already work closely with transportation agencies and public works departments. One nontraditional yet key partner will be the public health department. To determine the extent to which planners are engaged in such partnerships with the goal of creating an environment conducive to physical activity, we asked respondents to indicate which local government agencies and departments had collaborated with them since 1998 (Figure 4). By a significant margin, the largest percentage (65 percent) had collaborated with the parks and recreation department. This was followed by public works (45 percent) and transportation (31 percent). Only 8 percent of respondents indicated they had collaborated with the public health office on this issue. Figure 5 Smart growth is directly supportive of goals to increase physical activity; specifically, smart growth seeks to encourage compact design, walkable neighborhoods, and the creation of more transportation options. We asked respondents to indicate which of the 10 smart growth principles (as promulgated by the U.S. EPA Smart Growth Network) have been implemented in their community since 1998 (Figure 5). At 76 percent, provision for mixed-use development scored the highest, followed by open space preservation at 63 percent. In fact, with the exception of the certainty principle (that is, providing clear rules and timelines for development review), around half of all respondents indicated that all the principles had been implemented to some degree since 1998. Together, the implementation of numerous smart growth principles and measures will provide a solid foundation for expanding community planning and design to address the goal of increasing physical activity. Figure 6 Focusing on walkable communities, we asked respondents to indicate the specific measures their jurisdiction has implemented supporting walkability and physical activity. Recognizing that many reforms take place incrementally, we asked respondents to tell us whether the actions had been implemented to a large extent, to some extent, or not at all (Figure 6). Again, mixed-use development was the most commonly implemented measure, with 31 percent indicating they had included provisions in the zoning ordinance to permit it and an additional 50 percent having done it to some extent (i.e., presumably they allowed it in some but not all districts). Also scoring high were bicycle and pedestrian trails, with 26 percent indicating they had required or encouraged the incorporation of such facilities into subdivisions since 1993, with an additional 46 percent having done so to some extent. Increasing development density near transit also scored high — 16 percent indicated it had been implemented to a great extent, and 46 percent said it had been done to some extent. Perhaps the most broadly encouraging finding was the results for smart growth plans and policies. Seventeen percent indicated that the jurisdiction had incorporated smart growth polices into plans, ordinances, and development review processes, and more than half (53 percent) said they had done so to some extent (Table 20). Figure 7 Next we asked respondents to be even more specific about facilities being installed to support bicycling and walking, such as sidewalks, bike lanes, and street furniture (Figure 7). We asked whether each element is required by the jurisdiction in most cases, all cases, some cases, or not at all. In practice, the jurisdiction installs some facilities, such as bike lanes; on the other hand, a developer installs sidewalks in most cases. By a significant margin, the most common required element was sidewalks in new developments (53 percent require them in most or all cases; 33 percent require them in some developments). Also scoring high was a requirement or condition that new sidewalks be a minimum of five feet wide (34 percent require them in most or all cases; 31 percent require them in some cases). Urban designers and advocates for pedestrians regard this as the width enabling users to walk two abreast and to pass others or be passed safely. Scoring lower, although still relatively common, were several other facilities, including requiring or providing pedestrian-friendly architecture, such as building designs that minimize the amount of blank wall area in high-pedestrian-traffic areas, awnings and shelters near transit, and street furniture and street trees. According to the survey, 15 percent indicated that such elements are required in all or most cases and 43 percent said they were required or provided in some cases (Table 31). Figure 8 There are a number of actions outside the typical planning purview that local jurisdictions can undertake to support a physical activity agenda. Indeed, many communities that have made health and activity a priority have implemented some of these measures, some of which may be led by agencies other than planning. In the survey, we asked respondents to specify which actions (out of a list of seven) their jurisdiction had undertaken since 1998 (Figure 8). Seventy-three percent of respondents said their jurisdiction had inventoried park and recreation facilities, and 62 percent indicated the jurisdiction had increased spending on bicycle and transportation facilities. (Such spending can likely be credited in part to federal transportation enhancements monies that are passed through state departments of transportation on an 80/20 match ratio.) Scoring lower were studying the safe-routes to school issue (18 percent), hiring a bicycle pedestrian coordinator (18 percent), forming or recognizing a citizen advisory group dedicated to increasing physical activity (13 percent), and appointing a health representative to a planning and zoning board (4 percent). Figure 9 Finally, we asked planners to tell us which of the common types of plans in their jurisdiction contain explicit policies, goals, and/or objectives related to increasing residents' opportunities for physical activity (Figure 9). Other research has shown that very few jurisdictions have such explicit policies. We asked the question to unearth any examples of cities engaged in increasing opportunities for physical activity that are not yet known for having done so. The results we got were unexpected and suggest a problem with the wording of the survey question. In short, many more respondents than expected said several of their jurisdiction's plans contain explicit policies to increase opportunities for physical activity. As shown, 84 percent indicated the parks and recreation plan contains such explicit policies, 81 percent indicated that the comprehensive plan contains them, and 47 percent said the bicycle and pedestrian plan contains them. We expect that further analysis of the actual plans may show that, in the view of planners, policies, goals, and objectives related to walkability, alternate transportation modes, and quality-of-life enhancement — all of which are commonly found in the plans listed in the survey — are inherently supportive of physical activity goals. While it is significant that planners perceive that physical activity and health of residents are being addressed in these plans, expressly stating such goals would require a stronger civic commitment to health on the part of the local jurisdiction and would result in programming and resources directed at creating active communities. And, of course, broadening plans and the plan-making process to include health issues and advocating for greater focus on the issue could help leverage substantial and previously untapped support for all the smart growth reforms jurisdictions have undertaken in recent years. The Planning and Designing the Physically Active Community Resource List contains book, article, and government document citations. The list is part of a continuous process and may be considered a literature review as well as a resource list for the project. Texts were chosen for the resource list based on several criteria, including relevance to the topics of planning and the promotion of physical activity, timeliness, the ability to convey concepts accurately and concisely. The resource list is arranged under the following topics, Popular Literature, material that is of interest but is not specifically about planning and physical activity, including articles that appeared in the popular press; Planning Literature, information written by/for planners; Health Literature, information written by/for medical and public health practitioners; Plans and Guidelines, outstanding plans and technical assistance documents from states and communities; and Law and Legislation, ordinances and other legal documents of interest. This project was made possible by a grant from the Robert Wood Johnson Foundation. Its puropse is to encourage changes to the built environment that will promote physical activity as a means of improving the health of Americans.